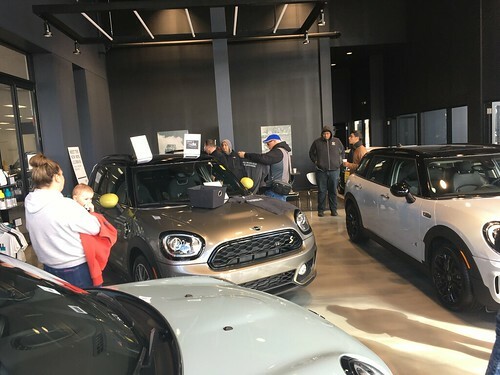 The Chicago MINI Motoring club was invited to a group buy for a MINI Cooper wireless mouse.. details below. WRAPUP: Close to 50 MINIs attended this spectacular event!! The predicted rainy weather held off for the whole evening. We took a winding neighborhood drive along some twisty roads, and looped a couple area cul-de-sacs.. We filled up the back area at Superdawg for a fun hang out, listening to DJ tunes by Source 1 DJ Services . Huge thanks to Superdawg for hosting our club, and Arnie and Lena for the planning/coordination work!! MINIs will be back at Superdawg on a prime time Saturday night!! This year we will meet up beforehand for a fun little neighborhod drive so we can all arrive en-mass. UPDATE: 05/24/2013 The time for the Bridge crossing/record attempt is set at 10:30 am on Saturday August 3rd. Still looking into logistics of getting up there in time.